Volvo B7R, Volvo B8R and Volvo B9R chassis fitted with a selection of bodies including the Irizar i6 3700, Marcopolo Audace and Volgren Endura bodies are in stock and available now. This is your chance last to secure the legendary B7R and B9R, which have now ceased production. PETER BARNWELL TECH FOR TECH’S SAKE? Car manufacturers can’t help themselves when building a new model. They cram in as much “new technology’’ and as many “new features’’ as possible some of which is ill conceived at best or irrelevant at worst. They do it to attract buyers, many of whom, I am sure, can’t or don’t use the features. Even if they never use it, buyers seem to enjoy boasting about the kit in their car, taking pride in the tech heavy new models that are coming onto the market. Take for example, auto lock/unlock which might sound good until you walk near the vehicle with the “key’’ in your pocket and it automatically unlocks even if you aren’t getting in… lock, unlock, lock, unlock – it’s ridiculous. Then there’s the push button start…. wasn’t that what a simple key was for? And I just love the “drive select’’ modes that automatically default to standard settings as soon as you switch off the vehicle which means you have to keep on re-selecting them all the time…. Same as some Bluetooth systems that “unsync’’ when you switch off the engine. Drives me nuts. Some of the advanced driver assist technology is similarly irrelevant and at times dangerous. Autonomous Emergency Braking for example has already activated of its own volition in quite a few cars I have driven of late implementing a panic stop for no apparent reason. It’s a bit of a worry and sure makes you pay attention to the rear view mirror. Which brings me to buses that are also starting to show signs of the same features frenzy enveloping cars especially in vehicles from newer manufacturers. It’s as if they are looking for ways of escalating the price or trying to outdo competitors with features to secure a sale. driver assistance. The money is spent on engineering a “proper’ vehicle rather than on flash kit. A more rigorous validation system seems to apply to the application of new technology on buses and that’s a good thing. But one wonders how long it will be before individual air bags for each seat are mandated in all new buses. How long before AEB is mandated and blind spot monitoring, radar cruise, active lane keeping, active parking assist, adaptive headlights and so on. I can see the benefit of lane keeping assist but not ‘active’ lane keeping that takes control of the steering. democratically applied to motor vehicle as long as the boffins have proven their systems to be foolproof and worthwhile. If it cuts the road toll then it’s worthwhile but how far down the high tech track are we prepared to go and how much are we prepared to pay? That will be borne out fairly soon I would imagine. Also in this issue we have a feats of interesting stories. We look at the rebirth of Custom Bus after nearly a decade of roller coaster corporate fortunes thanks to the arrival of Scott Dunn. Speaking of rebirths, we also have an interesting story on the Daewoo Bus brand and its rebirth on the Australian market with the backing of White Commercial Vehicles. While on the subject of industry matters I have an interview with Volvo Bus Australia’s new boss Lauren Downs and we take a look at a very green Volvo operator at Tasmania’s Cradle Mountain. As well as all that we road test Optare’s new MetroCity bus, we take a look at a Scania coach operator in Queensland and a whole lot more, so enjoy the read. Cheers and safe driving. After a disastrous collapse former Daewoo distributor Asia Motors found itself in the hands of the liquidators, but now a little over 12 months later a new Daewoo distributor for has been born. We sat down with Lou Riccardi to get the inside story on what happened and how Daewoo is rising again from the ashes of Asia Motors. British bus maker Optare has burst on to the local bus scene and is trying hard to win over local operators with its advanced monocoque construction and a variety of bus sizes. We took the chance to road test the latest addition to the local Optare line up, the MetroCity, its lightweight, compact 10.8-metre city bus. Volvo is the leading brand in the Australian bus industry, easily outstripping its rivals in the market thanks to its long established recipe of efficiency, reliability, good running costs and service. Volvo has given itself a major advantage by appointing a new general manager for its Bus operation in Australia, who arguably has more knowledge and exposure to these future technologies than anyone else in the local industry. Editor Peter Barnwell sat down for a chat with the talented Lauren Downs. Coach & Bus Magazine is published under licence by Transport Publishing Australia. 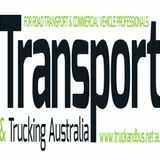 and is distributed to road transport professionals, fleets, business professionals and the industry throughout Australia. All material contained herein including text, photography, design elements and format are copyright and cannot be reproduced by any means without the written permission of the publisher. Grayhaze Pty.Ltd. is a member of the Copyright Agency Limited (1800 066 844). It takes a special person to be a tour coach driver and Terry Sullivan owner of Terry’s Tours is just that. In part he is at various times a travel agent, host, entertainer, guide, chief cook and bottle washer, problem solver, cleaner, fountain of knowledge and medico. We take a look at Terry and his tour operation. The near pristine environment around the famed Cradle Mountain in Central Tasmania is not a place you want to sully with emissions from diesel engines, which is why a local Tasmanian bus operator has purchased some clean and enviro friendly Volvos for tourism transport in the region. Editor Peter Barnwell takes. a look at the innovative operation. If you thought Usain Bolt was the only star sprinter in the world these days then think again, Mercedes Benz has launched the latest version of its Sprinter, a star in the mini bus market around the globe and its headed down under in the near future. Peter Barnwell takes a look at the Three Pointed Star’s latest Sprinter. In what is a bigger comeback than Dame Nellie Melba, Custom Bus has gone from an insolvent shell of a company to a reborn. Coach & Bus dropped into the new Custom factory in Sydney’s west to sit down with Scott Dunn, the man who bought the operation at the 11th hour and has turned its fortunes around in just a few months. Editor Peter Barnwell has his say on the growing technology tidal wave and what it might mean in the bus world. 04 UP FRONT We wrap up the key local and international bus and coach news that affects us as a global industry and where we are heading. Editorial contributions are welcome for consideration. Contact the Editor or Publisher for guidelines, fees and level of interest. All unsolicited manuscripts must be accompanied by a stamp, addressed envelope for their return. We will not be held responsible for material supplied electronically. We drive Jaguar’s F Pace SUV. Paul Clitheroe’s latest advice on finances. BENZâ&#x20AC;&#x2122;S NEW SPRINTER MINIBUS HAS UPPED THE ANTE ON THE SMALL BUS SCENE WITH A CHASSIS THAT IS SECOND TO NONE IN THE SECTOR. other bus services. Some highfrequency bus routes will continue to operate on the busway, providing a network of suburbsto-city services for residents across Brisbane. Brisbane Metro was first announced in 2016 as a solution to the current challenges facing Brisbane’s bus network, which has reached its capacity at many inner city locations. In May 2017, Council released the Brisbane Metro Business Case, following a 12 month detailed assessment of the benefits, costs and impacts of delivering the project. According to the Council the Business Case confirms Brisbane Metro is a value-for-money investment in its public transport network that will provide significant benefits for both the city and the region. The bus you’ve been waiting for. Make a safe and sound investment. The comfortable, 12-seater Renault Master Bus comes complete with everything you’ve been waiting for. Don’t miss out on the big bus, that’s even bigger on value. Head to your nearest Renault dealer today. Renault MASTER BUS ^First three scheduled services capped at $599. Service interval is 12 months and up to 30,000km, whichever comes first. *Recommended drive away price for 2018 build MASTER Bus with solid paint valid for vehicles ordered before 30/06/2019. ABN buyers only. Renault reserves the right to vary, extend or withdraw this offer. further strengthened by Skybus’s most recent order for 15 route buses built on MAN’s LE19.320 RC2 city bus chassis, which boasts the proven reliability of the predecessor bus chassis models that have already accumulated nearly one million kilometres,” said Stoermer. “The MAN LE19.320 RC2 city bus chassis features the unequalled performance and reliability of MAN’s whisper-quiet, powerful and fuel-efficient 10.5-litre Euro 5 city bus engine,” he added. “This outstanding driveline, combined with MAN’s city bus chassis, makes for a pleasant, safe and reliable shuttle service that SkyBus is renowned for providing,” Stoermer concluded. lightweight, fuel-efficient qualities. “Just as BCO has expanded its operations in NSW, its clear that many Queensland fleets are also considering Optare purchases for their operations and the agreement with Rodd, Athol and the BCSA team will enable us to better service those customers,” said Jason. “BCSA will have Optare demonstrator buses available from its Yatala operation for Queensland fleets to trial on their own routes enabling them to benchmark the Optare buses against their current vehicles to see the efficiency gains that can be made,” he said. Jason Pecotic revealed that on a recent visit to the Bonluck factory in China he saw the full range of products being built to specification for our conditions including luxury coaches for Australia, articulated buses for NZ and nine-meter city buses being built for Australia and NZ along with coach bodies being built on European chassis for both Australia and NZ. “Bonluck a dedicated specialist bus and luxury coach builder building more than 5000 vehicles a year and basically, every bus and coach option they have is now available and from BCO’s perspective we are very excited to be able to offer every combination available alongside Optare product,” said Jason Pecotic. The appointment of BCSA as the Optare dealer in Queensland and Northern NSW comes on the back of the first Optare deliveries of a 114 bus contract for Tranzit in the New Zealand capital of Wellington. LIGHT WEIGHT AND VERSATILITY = FLEXIBILITY INTRODUCING THE VERSATILE NEW METROCITY Versatility is the key word with Optare’s new MetroCity offering a range of sizes to suit your routes from 10.1 through 10.8 to 11.5 metres and seating for 25 to 44 with total passenger capacity of up to 60. MetroCity can be tailored and configured for tight routes while Optare’s highly efficient and versatile monocoque design ensures light weight, fuel efficient with powertrains from Mercedes Benz, Cummins and Allison as well as advanced electric models. Optare is backed by one of the largest automotive groups in the world and brings more than a century of bus knowledge and expertise to the road. Why not follow the lead of New Zealand’s Tranzit Group, which has successfully deployed 114 versatile new MetroCitys in and around Wellington. Contact Bus Corp Oceania to arrange a trial of the new Optare MetroCity. systems more commonly found in high end passenger cars, such as adaptive cruise control, tyre pressure monitoring, lane guard departure warning, and emergency brake assist. And that is all offered as standard,” Stoermer said “This chassis meets all the requirements that our coach customers demand: performance, efficiency, low whole-of-life costs, and maximum safety,” he concluded. * average weight statement compared to a quality 22.5 x 8.25 Steel disc wheel equivalent. engine. While a Wankel has a three -sided rotor and a twolobed housing, the X engine has a two-lobed rotor in a three-sided housing. The X engine captures the main advantages of the Wankel (high power-to-weight ratio; simplicity; and inherent balance), but also addresses the design deficiencies of the older engine. Because the combustion chamber is located in the stationary housing with most of the gas displaced during compression into this chamber, the X is uniquely suitable for high compression ratio operation with direct injection and compression ignition. The combustion chamber can take any geometry and be optimized for surface-to-volume ratio. The apex seals of the X are located within the stationary housing. Because they do not move with the rotor, the seals do not experience centrifugal forces. Lubrication is simpler, with oil consumption lower. Phase II also lays a foundation for future work. When development of the fully packaged engine is complete, the 30kW X4 engine is expected to weigh just 13.6 kg and fit into a 20cm x20cm x20cm box, while achieving 45 per cent brake thermal efficiency—approximately an order of magnitude smaller and lighter than traditional piston diesel engines, and also 30 per cent more efficient. Australia since 2005, is a massive public transport juggernaut and one of the biggest bus operators in the world with a fleet of more than 42,700 buses. According to CDC’s MD and group CEO, Yang Ben Seng, Australia has been a key investment target for the company because of the transparent and stable regulatory environment. “Australia also has strong growth prospects and proximity to Singapore and with this acquisition we will add on two new footprints to our NSW operations,” said Yang Ben Seng. in strength, giving a competitive engine weight of just 280kg for the ISF 3.8 used in the H7. The Higer H7 Cummins 3.8litre ISF power plant produces maximum power of 115 kW @ 2600rpm and maximum torque of 550 Nm @ 1300rpm, which translates to 5 per cent more power and 17 per cent more torque than the current Fuso E4 engine in the Rosa. Higer’s use of Cummins engines across it’s range offers a major advantage for Australian bus operators with nationwide service back up through Cummins’ network of service operations across the country from major capital cities to remote regional centres. Munro will be supplied standard with the Allison 1000 series automatic transmission, which will also have the full back up of Allison Transmission’s national service network along with a full five year transmission warranty, an Australian first for the bus industry. ate in 2016 the alarm bells started to go off at Asia Motors, the then distributor for Daewoo Bus. Those alarm bells were going off because of increasing problems at its primary body builder, UBC in Malaysia. The sense of a growing crisis was making Ian and Bruce Campbell, who had run Asia Motors since 1963, along with their CFO Lou Riccardi, increasingly anxious. Demands for up front payments, longer production delays and other issues and finally the fact that UBC was put into administration saw Bruce Campbell jump on a flight to Kuala Lumpur to see what could be salvaged. Asia Motors had close to 20 buses in build at UBC in various stages of completion. something that we did not have in the Asia Motors days and that will go a long way to building confidence in Daewoo again, not to mention the strong financial resources behind Whites,” Riccardi added. While the entire Malaysian debacle that claimed the once proud Asia Motors and pretty much the life’s work of the Campbell Brothers is something that no one can rejoice in, the fact is White’s buy in to Daewoo Bus in Australia has enabled the phoenix to rise from the ashes. The reborn Korean bus brand with a strong distributor, will be something that might cause other brands some sleepless nights, we certainly think they will. DAEWOO BACKGROUND Daewoo Bus is a fascinating case study in corporate vertical integration and pragmatism. Until the Asia Economic Crisis in 2002 Daewoo was part of the massive Daewoo Industrial Corporation but the financial meltdown that followed the crisis meant that Daewoo and its many components would need to be broken up and sold. Daewoo Cars, already closely aligned with General Motors was purchased by the company’s Australian subsidiary GM-Holden. Indian conglomerate Tata, Daewoo construction equipment was sold off and became Doosan. The ship building business was sold to Korean interests while the Daewoo Bus found an unusual suitor in the form of Mr Sunghak Baik. Mr Bail is the man behind Korean hat maker Yung An. Mr Baik established Young An Hats in 1959 and has built the business into a multi-million dollar operation which today manufacturers close to 800 million hats with revenue in excess of $AUD284 million globally each year from its headquarters in the Korean city of Buchon. Young An is a private company and it has manufacturing facilities in the United States, Mexico, China, Sri Lanka, Bangladesh, and Vietnam sales operations in Canada, United States, Mexico, and Hong Kong. When Young An bought Daewoo Bus in 2002 Mr Baik main motivation was accessing a supply of buses to transport his workers to and from his factories. However Daewoo Bus has grown a life of its own under Mr Baik’s stewardship and has become a strong and vibrant profit centre in its own right and a valuable contributor to the corporate coffers. Likewise Mr Baik shocked the materials handling industry when he decided to buy the Clark Forklift Company in the USA making a cash bid for the company because he needed forklifts for his hat operation. Clark has also been turned into a major contributor to the business. You have to take your hat off to Mr Baik he is certainly brimming over with business expertise and acumen and its application to Daewoo Bus has saved the brand and with Whites Commercial Vehicles on the job in Australia and New Zealand there is likely to a lot more Daewoos plying Australian roads in the future. CITY LIGHTS British bus maker Optare has burst on to the local bus scene and is trying hard to win over local operators with its advanced monocoque construction and a variety of bus sizes. We took the chance to road test the latest addition to the local Optare line up, the MetroCity, its lightweight, compact 10.8-metre city bus. smaller on demand mini buses and the larger 12 and 13 metre single and double deckers being used more on trunk routes. This is particularly significant given increasingly compact road infrastructure in new suburbs where big full size buses struggle to negotiate the narrow thoroughfares The MetroCity is the bus that Optare found sales success in New Zealand with recently through a large 114-bus contract with Tranzit, as we wrote about in the last issue of C&B. When Optare distributor Bus Corp Oceania mentioned there was now a MetroCity demo available in Sydney we thought it would be a good idea to road test the monocoque construction compact city bus. torque converter it moves away smoothly and without fuss. The next thing to note is the steering, which is sharp and precise and not over boosted. The feeling is good and it is easy to position the bus on the road and know exactly where the steering wheels are pointed all the time. The steering uses a ZF system and is very good The Optare feels light and easy to drive, that maybe because it is around a tonne lighter than an equivalent body on frame bus, but perhaps it is more to do with just the way the monocoque is sprung and suspended. Certainly its ride is smooth, compliant and comfortable thanks to the Albion twin airbags on the front axle along which are coupled with leading taper leaf springs and a Panhard rod, while at the rear there is Albion four bag air suspension. C&B wheeled the Optare around the suburban streets of Smithfield and Wetherill Park in western Sydney close to BCO’s HQ, threading around the industrial and residential streets, negotiating narrow roads and the wide thoroughfares with equal aplomb and ease. Stopping power is excellent with the Wabco system ABS in combination with the electro magnetic retarder, pulling the bus up with supreme safety and efficiency. With BCO sales manager Francis Burdock on board, he was quick to point out that the MetroCity can be configured in a range of ways with various layouts for wheelchair passengers or in a variety of seating options. For instance in New Zealand Tranzit has ordered both 10.1 and 10.8 metre MetroCity variants for its requirements and Burdock believes that some operators in Australia will favour the shorter variant others will go for the 10.8 metre. Versatility is clearly the key and MetroCity offers plenty of versatility and according to BCO it is eminently easy to service and maintain, no doubt added to by the Cummins Allison driveline which promises pretty trouble free operation. Driving the MetroCity we were able to keep an eye on our efficiency performance on the instrument screen with ‘bar graph’ readout showing various aspects of driving efficiency. It shows fuel economy, harsh and sudden braking and a number of other measures to gauge the driver’s performance. Thankfully on our drive our performance was exemplary with all green and no yellow or red bars indicating poor performance, but in a relatively easy drive and no schedules to meet it was easy to make the green bars light up. The other factor to remember is that the one tonne advantage the monocoque offers, allows potential added payload and or reduced fuel consumption by its very nature. Optare has certainly burst on to the bus scene with a great deal of enthusiasm and is trying hard to fight its way on to selection panel lists which is never an easy task. It strikes us as being kind of ironic, given that Optare’s forebear was of course Leyland, which totally dominated public transport purchasing in Australia up until the late 1970s. Having said that the new Optare is very different to the old Leyland we all used to ride to school on and with this new high tech monocoque construction, strong drive lines and components and excellent build quality demonstrates just how far they have come and how good they are. Any bus operator would be silly not to at least consider Optare on the purchasing list. THE WAY Volvo is the leading brand in the Australian bus industry, easily outstripping its rivals in the market thanks to its long established recipe of efficiency, reliability, good running costs and service. As the bus industry faces the challenges presented by new technology, electromobility and autonomous vehicles, Volvo has given itself a major advantage by appointing a new general manager for its Bus operation in Australia, who arguably has more knowledge and exposure to these future technologies than anyone else in the local industry. Editor Peter Barnwell sat down for a chat with the talented Lauren Downs to see where things are headed. ou could say that Lauren Downs has a strong commitment to Volvo Bus and you would be 100 per cent correct. Downsâ&#x20AC;&#x2122; career so far has been fully entrenched with the Swedish based global bus maker, spanning a number of key positions in Australia, Sweden and Singapore. In fact she joined the company straight out of the University of Wollongong, where she gained a Bachelor of Business and Marketing. A decade later, the high achieving Downs is back in her home country and at the helm of Volvo Bus Australia after fulfilling a range of roles within the Volvo empire at various locations around the world. Hailing from the sleepy south coast town of Kiama, Lauren applied for and won a scholarship with Volvo Bus after completing her undergraduate degree, enabling her to further her qualifications within a corporate structure. The role saw her move to the head office of Volvo Bus in Gothenburg in Sweden for a number of years and then to other places where she interacted with Volvo staff around the globe gaining insight into many Volvo programs including the implementation of Euro 6 powertrains and electromobility. Lauren returned to Australia about 18 months ago after spending time in Singapore in a commercial development and marketing role. After fulfilling other roles with VGA, Lauren was earlier this year appointed general manager of Volvo Bus Australia, now based in Brisbane. Given her exposure ``at the pointy endâ&#x20AC;&#x2122;â&#x20AC;&#x2122;, Lauren is a great sounding board for the bus industry as we found during the course of this interview. HERE’S WHAT WE ASKED HER: In the light of broad scale electrification of route buses starting to happen around the world what does Volvo Bus have planned for Australia. as well as the highly successful transport website, www.truckandbus.net.au Gravel Roads Australia will feature great writers with features and news produced by some of the best journalists in Australia with high quality photography and design. The first edition will be published in March 2018 and then in June, September and December each year. The magazine will be direct mailed to more than 3000 Local Govt Works Officers, Civil Contractors, Transport Operators, Machinery Dealers and Manufacturers as well as Mining Companies. It takes a special person to be a tour coach driver and Terry Sullivan owner of Terryâ&#x20AC;&#x2122;s Tours is just that. In part he is at various times a travel agent, host, entertainer, guide, chief cook and bottle washer, problem solver, cleaner, fountain of knowledge and medico, These are just a few of the roles Terry Sullivan undertakes as a tour meister aboard his Scania tour coach based at Tweed Heads on the southern edge of the Gold Coast. We take a look at Terry and his tour operation. three quarter of a million-dollar coach. by P & D Coaches in Murwillumbah. degrees. This job takes me everywhere. Coach Design in Brisbane and ordered their made the decision to replace his coaches every three to three and half years and is now on his seventh. Carpentaria at the top of Australia. “I also love Tasmania” he says. customer service, Terry sold it and has never looked at one since. Coach Design as he could design his coach the way he wanted. year to his 1500 Touring club members. year he takes 50 people away. Scania coach is its unique service. away they’ll buy me a present,” he laughs. Terry credits his wife Lynne with keeping the business together. tours and has the knowledge of a younger generation, so they are looking forward to her expertise. and heard nothing but good things, so he bought it. At Challenger Bus and Coach, we’re introducing a new coach specifically designed and built for the Australian Bus & Coach industry and our unique conditions. The Challenger V12 – 12.3m with your choice of 53 to 57 leather TST or Styleride reclining seats, or up to 70 Styleride seats in our School Bus 2 x 3 configuration. The Challenger V10 – 10.5m with your choice of 39 to 43 leather TST or Styleride reclining seats, or up to 62 McConnell seats in our School Bus 3 x 3 configuration. Both the V10 & V12 are configurable to suit your specification – toilet or bunk equipped, more or less seating. Our flexibility will support your requirements. We’re here for the long haul. Durability and Flexibility are our key drivers. Longevity achieved with key structural items such as Stalatube Stainless Steel frame, Compressed Fibreglass stretch panels, Aluminium Bin Doors, large pressurised luggage through-bins with Stainless Steel floors and walls, British Cummins 360HP engine with US Allison Transmission and German ZF running gear. Solid and reliable. AND the optional extras you have to pay for with other companies are included with Challenger Bus and Coaches – Bull Bar, Stone Guard, Alcoa USA Black Label rims, reclining leather seats, GPS & Surveillance system – just to name a few. For more information visit www.challengerbusandcoach.com.au or call us on (07) 4098 2380 * Challenger Bus and Coach will be coming to New Zealand soon..! The Cradle Discover hybrids will feature custom built bodies from Bus-Tech with quite a different seating configuration. Each vehicle is purpose built to deliver optimised viewing for the trip into the park. Simon McDermott said “We hope to see the first of the hybrids delivered in December this year. “We are really excited about them…a vehicle that will pull up and take off from stops in silence, charges its own batteries without the need for external infrastructure and significantly lower emissions, while it will also will deliver a higher passenger capacity than previous vehicles. McDermotts Coaches are the first to bring Hybrid diesel/electric buses into Tasmania and one of only a few who have implemented this technology into their bus fleet in Australia. If you thought Usain Bolt was the only star sprinter in the world these days then think again, Mercedes Benz has launched the latest version of its Sprinter, a star in the mini bus market around the globe and its headed down under in the near future. Peter Barnwell takes a look at the Three Pointed Starâ&#x20AC;&#x2122;s latest Sprinter. ercedes-Benz vans had a big month in July 2018 with three major events all happening at roughly the same time. There was a new Sprinter launched, it delivered its 25,000th minibus and a celebrated 20 years of minibus production. However the biggest story was on Benz’s new Sprinter minibus which has upped the ante on the small bus scene with a chassis that is second to none in the sector. The gestation period for new light commercial vehicles can be as long as a decade and such is the case with the current Mercedes-Benz Sprinter that has been with us for in various forms for some years. The popular van-based minibus in all permutations is in the new generation launch phase after a debut in Germany mid-July. gross vehicle weight of 6.8 tonnes. Alongside the new Sprinter City 75 is the more compact Sprinter City 45. Moving to the versatile Sprinter Transfer we see it is available in a four model lineup ranging from the 5.9-metre-long Sprinter Transfer 23 to the 7.7metre Sprinter Transfer 55, which features an extended rear end that complements the design perfectly. The Sprinter Mobility is aimed specifically at carrying passengers with restricted mobility. The compact Sprinter Mobility 23 benefits from having a permissible gross vehicle weight of just 3.5 tonnes. The Sprinter Mobility 45 commands particular attention with its raised floor added over the wheel arches. This allows two wheelchairs to stand alongside each other at the level of the rear axle. The launch of the new minibuses will be staggered and will reflect the availability of the Sprinter. It will start later this year in Europe with the Sprinter Transfer 23 and 35, the Sprinter Mobility 23 and the completely re-engineered Sprinter City 75. The rest of the models in this series will follow next year, as will all models of the Sprinter Travel. Once the model changeover is complete, by quarter three of 2019, the product range will comprise more than 20 left-hand-drive and righthand-drive models. Celebrated at the launch event was a milestone for the little Benz buses when Busitalia took delivery of the 25 000th minibus by MercedesBenz on July 5th 2018.
standard with an air-sprung rear axle, the 7G-Tronic Plus torque-converter automatic transmission and a 163hp diesel engine. The Busitalia hand over also coincided with Mercedes-Benz minibus production reaching 20 years since EvoBus began its activities in this segment by taking a significant share in the minibus manufacturer Karl Koch GmbH in Mudersbach near Siegen, thereby becoming the leader in this sector. Full acquisition of the business and the establishment of Mercedes-Benz Minibus GmbH, based in Dortmund, followed in 2004. Minibus production in Dortmund had already been gradually ramped up since 2000 and has now been completely concentrated on the plant there for the past ten years. production areas for the Mercedes-Benz Sprinter as the base model. All conversion work is checked and approved by the factory. All production processes meet the same high quality standards as apply for all MercedesBenz vans. EvoBus supports minibus customers and their buses after the purchase just as intensively as it does with full-size buses. From sales, production and service to subsequent recycling â&#x20AC;&#x201C; in the case of the minibuses bearing the three-pointed star, everything is handled by a single company. Australian bus operators can expect the first of a staged rollout of the new Sprinters arriving around the last quarter of 2018 with more versions arriving into early 2019. We also bring you all of the latest news in an easy to consume email bulletin, Bus e-News giving you all the detail on the biggest stories and industry news allowing you to click through to the website. Custom Bus, it was fair to say that the industry was taken by surprise. matter of seizing the day and taking the chance and it changed Dunn’s entire business focus. Sydney operator Telfords a few years back. switched and the new plan for Telfords is pitch for government contracts. the leap into manufacturing came about. has had a chequered past, having suffered eight years. organisation in the past eight years. of seven buses, all of them used, in 2008 and the UK operation quickly grew. house with a pile of debt and I decided to just go for it,” he added. mixture of local bus routes and express coach services across the UK. thought about it, done the research and had crunched the numbers and made an offer the next day,” he added. accepted and all of a sudden I was a bus maker,” he smiled. which was important and integral to the Australian economy. and deliver the product faster. presence in Australia if he hoped to win such contracts. new factory facility in St Marys and had just three weeks to move the operation from the old Villawood factory to the new location. It was by all reports a mammoth task. when the Dunn Group purchased Telfords in May 2014.
rise to promote better productivity and pride in the job. “Efficiency has picked up and we have reduced production hours from around1400 man hours per bus to just under 1000 hours,” said Dunn. By our calculations that alone has pulled around $20,000 out of the build cost with more efficiency to come according to Dunn. Custom’s rebirth and its new location will be a boon for apprentices with Dunn determined to train tradesmen and women to create the skilled workforce the company will need, hopefully for a long time into the future. In the short term the new Custom has 20 apprentices about to start their training with the company. Many of the experienced staff who have come across to the new operation started their careers as apprentices with the old Custom business. Custom’s newly appointed NSW sales manager, Rob Lanteri is a prime example of this as he did his ‘time’ at Custom as an apprentice in the late 1990s and has now re-joined the company as its sales manager, having moved there from a senior bus role with Scania. Down on the factory floor there is a buzz at the new Custom Bus, workers are hard at it fabricating the side frames on jigs and the roof panels before they’re brought together before being lifted and lowered on to chassis, which have already been prepped for their arrival. The fit out then commences with components and panels fabricated in separate areas alongside the L shaped line. New computer controlled laser cutting machines have joined others that came across in the big move along with jigs and frames that enable the workers to produce ancillary wiring looms, panels, complex door units, window frames, seat mounts, in fact the whole gamut of bus body manufacturing. to make this work,” said Dunn. Dunn has set himself a punishing schedule in running Telfords and the new Custom. He rises early and is at Telfords before dawn each day working through to around noon when he heads across to Custom where he works through into the evening. On top of that he heads back to the UK every eight weeks for a week to oversee his English operation. The 44-year-old Dunn exudes confidence and energy and his determination is evident in everything he says. While many, including the administrator, had pretty much written Custom off six months ago, there is a lot of evidence to suggest that the company has risen out of the ashes and is now a stronger, more nimble and far more competitive operation than ever before. If what Scott Dunn has achieved in a few months can be continued and grown, then the other bus body makers and those importing fully build buses will have a bit to be worried about. from the Bosnjak family. CCMC largely focussed on building bodies for private bus operators and apart from a few forays into government bus supply, including half a dozen MAN buses for Canberra’s ACTION (thanks largely to its take over of Smithfield Bus and Coach Works and a contract inherited as a result) and around 19 Scanias for the NSW State Rail Authority in 1982, it had a totally private bus company focus from 1958 until1995. In 1988 CCMC purchased WA Newnham in Melbourne and changed the name to Newnham Custom but this operation was closed in 2001. CCMC opened a plant at Arundel on the Gold Coast in 1995. CCMC joined a consortium with Jim Bosnjak and John Hewson in 1999 to purchase the remnants of the famous PMC bus building operation following the collapse of Clifford Corporation. It renamed it Australian Bus Manufacturing, basing its operation in Adelaide. A year later CCMC bought out its consortium partners in Australian Bus Manufacturing rebranded its operation as Custom Coaches in 2004. After years of spurning government supply contracts and tenders Custom changed its course in 1998 and bodying buses for the NSW State Transit Authority, a break of 37 years. Over the next 15 years it built more than 1,280 for the NSW government transport authority. Custom had remained largely in the control of the Hillsdon Violet clan and in 2002, Mark Burgess, the great-nephew of Stanley Hillsdon, became CEO of the Custom. Three years later in 2005, Mark Burgess, his brother Paul and long-term business partner, Chris Absalom, purchased the business from Jack Violet. By 2009 annual production was in excess of 400 buses and the company achieved the milestone of producing 15,000th locally built bus body. Having been in family control since 1935 Custom was purchased by British bus manufacturer Alexander Dennis. It was the start of tumultuous times for Custom after decades of relative stability. Custom Coaches was placed in administration in May 2014 only to be purchased back by Mark Burgess and Allegro Funds three months later and the company was renamed Custom Bus. Tough times followed and Custom Bus rolled on for three and a half years before again being placed in administration in February 2018. It was this second corporate failure that saw the remnants of the company scooped up by the Dunn Group, which has rebooted it as Custom Bus with a new ABN, a new identity and a new ethos with a new factory in St Marys where its full steam ahead for the future. Jaguar has had a renaissance thanks to the investment and recapitalisation that has come from its current owners, the Tata Group from India and like every luxury maker on the planet the famed British marque now builds SUVs alongside its elegant sports cars and sedans. Some may not like the thought but after a week with the Jaguar F Pace we came away impressed with this endearing and rewarding machine. here was a time when Jaguar was a maker of beautifully designed sedans and sports cars, automotive sculpture with elegant lines and flowing forms that made them look fast even when standing still. You can count the likes of the Mk2, the XJ sedans, the XK sports coupes and of course the E-Type, the car Enzo Ferrari once described as the most beautiful car ever designed. Jag still makes nice cars like the beautiful F-Type fastback and convertible and the elegant XE. XF and XJ saloons but like every brand in the world SUVs are the must have and Jaguar is no exception. For heavens sake even Rolls Royce, Bentley, Lamborghini and Maserati have SUVs, is nothing sacred. Well I suppose it all very well to rue such a change in the automotive landscape but if that is what people want then that is what you have to deliver. We had not had the chance to drive any type of Jag for some years so stepping into the Narvik black Jaguar F-Pace R Sport 25d, was a welcome revelation. The 25d is the latest engine option for the F-Pace with a 2.0 litre four-cylinder twin-turbo diesel in the Jag SUV, is what the company describes as an ‘Ingenium’ diesel engine and it does a very good job of moving the Jag’s svelte but fairly hefty mass which tips the scales at a shade under 1800kg. The Jag’s two litre turbo diesel pumps out 177kW of power and a whopping 500Nm of torque. The torque is what really hits you with a flow coming on from as low as 1500 rpm helping the F-Pace to lift her skirts and really get moving in a way that meets the old company motto, ‘grace, space and pace. The eight-speed auto is superbly matched to the diesel and can be sifted manually if required producing crisp changes that are almost imperceptible. It is a great gearbox indeed. However it is quite an economical engine and very responsive making city traffic easy as well as making country driving a relaxing cruise with torque on tap to make overtaking an hill climbing a doddle. Our fuel figures after about 350 km behind the wheel of the F Pace saw us record an average of 7.4 L/100km across a mix of city and country driving, a very reasonable figure for a heavy luxury SUV. While it is as heavy SUV the Jag doesn’t feel heavy and in fact is quite nimble and responsive more so than just about any SUV we have driven in years. however despite that size the spare is only a restricted size space saver spare which in our opinion is major handicap in a country like Australia in an SUV, no matter how sophisticated and well mannered they are, sorry we need full size spares in this country. In terms of value the F Pace could have a few more standard features and a few less high priced options in what is a vehicle that will set you back around $90,000 but you can forgive some of it with the superb dynamics and performance the Jag delivers. We just feel that things like the heads up display and adaptive cruise probably should be standard but that is our opinion. The Jaguar F-PACE 25d R-Sport is a very impressive SUV in very way and although it is closely related to its Land Rover and Range Rover counterparts it is individual and youâ&#x20AC;&#x2122;d never know it had so much DNA from its blood relatives. It is nimble fun and rewarding to drive if you want to push it and is sophisticated and luxurious when pottering through traffic and around town. We are fans and if you want a really great performing luxury SUV that has a sporty edge the F pace R Sport should be on your shopping list. Price: $87,925 (plus on-road costs) Engine: 2.0-litre four-cylinder turbo-diesel Output: 177kW/500Nm Transmission: Eight-speed automatic Fuel: 5.8L/100km (ADR Combined); 7.4L/100km (as tested) Safety Rating: Five-star ANCAP (2017). makes budgets so worthwhile – they jolt us into taking better control of our money. Putting together a sensible, real-life family budget is not hard and you certainly don’t need to account for every last cent. It does mean committing a few hours to work through an initial budget, but after this all that should be required is a bit of finetuning throughout the year. You may be amazed by what your budget reveals, like how much you are spending on small items that have a way of adding up – such as takeaways or Uber rides. This is all money that you are putting into someone else’s pocket rather than your own, and if you can cut back on these purchases you could probably save yourself hundreds of dollars each year. That could be enough to manage the increase in your home loan repayments without too much impact on your hip pocket or lifestyle. On another subject, that of investing it is my philosophy to Invest the way that suits you because if there’s one thing experience has taught me, when something becomes too hard or too time consuming, we’re more likely to give it away. Your attitude to money can shape the way you choose to invest. Some people have a keen interest in building a vast pot of money for its own sake. For others, money is all about what it provides – the ability to make choices about how you live your life. We all need to eat and pay bills, but money lets us enjoy the fun stuff like family holidays and personal hobbies be they golf, surfing, or, in my case, sailing. Another place we are all different is whether money is a passion or just a vague interest. You may for instance, be fascinated by the process of selecting shares. But that is too time consuming for others, myself included. If you love to spend a heap of time researching the sharemarket, good on you. I am quite happy to hold shares like BHP individually, but to be frank I have neither the time nor interest in keeping an eye on the shares of the future – small companies, which may become big companies in time. Nor would I pretend I can select and manage international shares without a lot of time and effort. This is what I love about managed funds. Of course, I want exposure to all these shares. And a professionally managed share portfolio lets me get the benefit of these investments while I am out sailing. How good is that? Fees are a drag on investment performance, so this is something to watch for with managed funds. But it’s the same if you go for DIY. The cost shouldn’t just be measured in terms of direct expenses like brokerage. You also need to work out the time you spend managing your investments (tax time can be especially challenging when either you or your accountant sort out your tax position). The bottom line is, if, like me, you want to do some direct investing yourself and still use professional fund managers, no problem. If you want professional managers to do it all for you, again, no problem. It’s all about investing in the way that suits you best. And it doesn’t have to be hard. Paul Clitheroe is a founding director of financial planning firm ipac, chairman of the Australian Government Financial Literacy Board and chief commentator for Money magazine. Visit: paulsmoney.com.au for more information.